Mark Geiger will ref the South Korea vs. Germany match on Wednesday. FIFA rejected a British media report alleging doping cover-ups among the Russian national team, saying it had not found any evidence of doping. 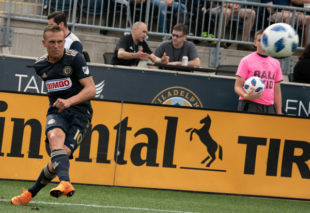 Tonight at 7, the Philadelphia Union Festival will take place at Wilson High School’s John Gurski Stadium as Reading United A.C. hosts a friendly against Bethlehem Steel F.C. It’s almost time for the MLS mid-terms, so Matt DeGeorge evaluates the Union. Matt Doyle opines about the Union. In U-19 news, the Union are out of the U.S. Soccer Developmental Academy Playoffs after a 4-1 loss to the LA Galaxy. Dockal and McKenzie were named to the MLS Team of the Week. I’m confused. If six Atlanta players can make the roster for the MLS All-Star game, how come the same number of Union players can’t make the MLS Team of the Week? The Union (and Chicago) are allegedly eyeing Everton defender Leighton Baines. D.C. United hired Rodrigo Robles as Director of South American Scouting, and Wayne Rooney will probably join the team on July 10, which is when the MLS transfer window opens. Orlando City’s next coach may not last, since he won’t have a say in roster decisions. Mike Fucito, who played for Seattle and San Jose, has joined Harvard men’s soccer coaching staff. The Ocean City Nor’easters shut out the winless Evergreen F.C. on Saturday night. President Carlos Cordeiro says “there’s no timeline” on hiring a new coach. A six-game series of friendlies are set for later this year. I admittedly haven’t watched enough of Baines the last couple years to say if he still does or does not have it anymore, but in general this would be a head scratcher for the Union. I know we’ve all craved a left back for so long, and a veteran would be excellent to help guide the young back line, but it would certainly not be a cheap acquisition or salary I would guess. The defense has surprisingly been the strength of the team this year so far, and I would much prefer we spend money on a true striker or RW even. I get the veteran presence, and I feel dirty saying I don’t want a left back, but maybe I’m just crazy. I would welcome other thoughts. I think the only thing we really need is a striker of quality. Right now it’s the only position underperforming and CJ looks like he’s lost his confidence to even take a shot.